Have you ever wondered why Portage Ave and Main St are so wide? How about Broadway with its nice wide boulevard and trees? Before Winnipeg Transit, there was the “Winnipeg Electric Company” which provided Streetcar and Trolly Bus Transportation until September 1955. Streetcars on rail lines, powered by overhead electric wires, went up and down Portage Ave, Broadway, Osborne, Pembina Hwy, Main St, generally in the center with all of the traffic. In total, there was over 120 miles of rail lines laid on Winnipeg streets. 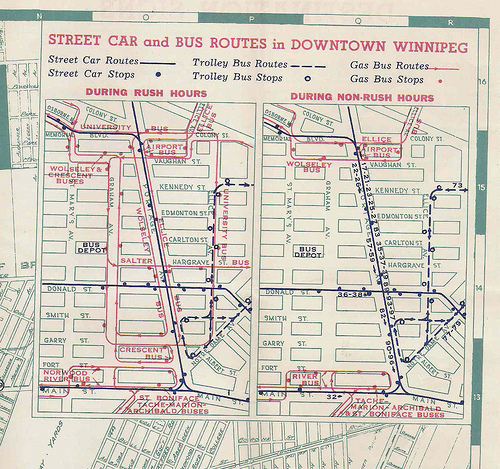 A Transit map from 1943 indicates the downtown routes. So to take a quick shortcut, here’s what happened to Streetcar 356 in the last 53 years. Streetcar service ended September 19th, 1955, and in October 1955, Car 356 (along with the rest) of the Winnipeg Electric Company (WEC) was sold for scrap. All metal components, including the truss rods, trucks, wheels and the motor, were removed and sold as scrap metal. The body of the streetcar was sold to a private individual for $100 and was left at Springfield Road at Panet until 1980, when it was bought by the Old Market Square Association. The association intended to restore and display the streetcar in Old Market Square, but this was not feasible. Instead, Heritage Winnipeg took ownership of the car until facilities for the restoration could be obtained. Because of the threat of vandalism, Heritage Winnipeg negotiated temporary housing for the car at Winnipeg Hydro’s Mill Street Substation in 1980. In 1989, it was moved to and stored in the Winnipeg Transit Fort Rouge Garage. However, in 1996, it had to move once again, and the Midwestern Rail Association obtained permission to store and restore Car 356. It is currently housed on temporary freight trucks at the VIA RAIL CANADA Union Depot. Car 356 is, to our knowledge, the last remaining wooden streetcar built and used in Winnipeg. It is a valuable reminder of the way Winnipeg used to be, and must be preserved for future generations.